“Shapes Go to School” is a fun and educational book for young children. 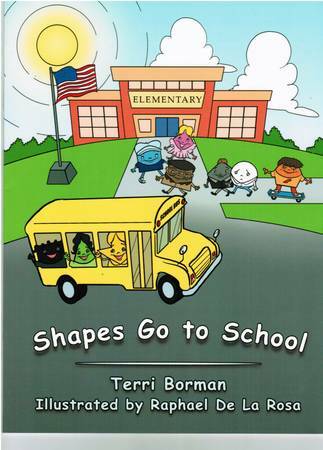 The very cute shape children from “Shapes Go to School” are going to elementary school for their first time. Some of the shape children are excited to go to school while some are sad and scared. Their teacher, Miss Heart, has asked each child to come up and introduce themselves. One by one the shape children come up and introduce themselves and tell the readers the name of their shape. They also tell the readers how many sides they have and what colors they are. Readers will learn about ten shapes and colors. One of the shape children, Circle, is sad and scared. He feels like he doesn’t fit in because he is different. He doesn’t have any sides like the other shape children because he is a round shape. Miss Heart and Star comfort and encourage Circle. In the end, Circle realizes that his teacher and friends are right. He is special and useful just the way he is! Overall here is what readers will take away from “Shapes Go to School.” Readers will learn about ten basic shapes and colors. They will learn about diversity because all the shape children are different shapes, sizes, and colors just like other boys and girls. Most importantly readers will learn about having a positive self-esteem and realize that they are special and useful just the way they are! This entry was posted in Uncategorized and tagged children's books, colors, diversity, education, Kindergarten, preschool, shapes on February 5, 2014 by terriborman.